Discolouration, wear, chipping and fractures, and misaligned teeth and missing teeth are only a few dental issues that can negatively impact your smile. If your teeth are damaged, or you’re embarrassed about how your smile looks, it affects your life in a variety of negative ways. Damaged teeth can make even the simplest things difficult, including eating and chewing normally. Worse, you may lack confidence when talking and smiling in front of others. But thanks to advances in dental technology and treatments, your A Supa Smile dentist can give you a ‘smile makeover,’ a comprehensive treatment that addresses these issues and more! If you or your loves ones have issues with your teeth or smiles, read on to learn more about the flexible and effective smile makeover. Then give A Supa Smile a call! And if you’ve read “The Great Gatsby” you know that Jay Gatsby’s smile was a brilliant social tool! Today, science has identified part of the reason smiles have such dramatic effects. A recent fMRI study found that viewing attractive faces activated the brain’s orbitofrontal cortex, a region involved in processing sensory rewards. While this held true for all attractive faces, the activity in this region was even stronger when the face in focus wore a smile. In other words, if you present an attractive smile to the world, the world feels rewarded. You are seen as a positive person, and treated accordingly. The power of a smile can be enormous! This is why a smile makeover is often a recommended treatment for patients who are displeased with their current smiles. Spaces and gaps between your teeth. Small teeth and/or “gummy” smiles. Stained or yellow teeth are making you look older. Your teeth are crooked, chipped, crowded or worn down. Your teeth do not work together well during biting or chewing. You hide your smile when posing for a photo, speaking, or laughing. Your self-consciousness limits your ability to connect with people. You dream of having a celebrity’s or friend’s smile, instead of your own. Your inhibitions about your smile negatively affect the perceptions other people. If your smile is not all that you dream of, you should consider a makeover! 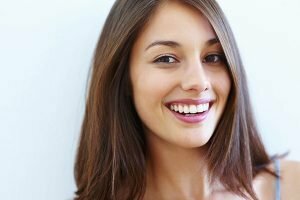 What can I expect in my Smile Makeover? Teeth Whitening can repair yellow and stained teeth. Whiter teeth not only improve your smile, but also make you look younger! If you regularly eat foods that are artificially colored, drink coffee, tea, wine, or smoke – teeth can become yellow and severely stained. This will negatively impact your appearance and can even make you look unhealthy. Dental Veneers can be used to close gaps in between teeth, evening tooth length, covering unsightly stains, and restoring teeth that have been cracked or chipped. Some crooked teeth even appear straighter after veneers are placed. Dental Crowns can be used when teeth are more severely damaged or broken. A crown entirely covers and surrounds the tooth. This improves the appearance of the tooth and strengthens it – When a crown is used, nothing touches the natural tooth and it is more difficult to damage. Dental Implants replace missing teeth in a way that looks completely natural. Dental implants are an excellent way to restore missing teeth because once the procedure is completed; you can enjoy your favorite activities and foods without worrying about the tooth falling out or loosening. Dental implants are so durable that you will not be able to tell the difference between the implant and natural teeth when you smile or chew. This list demonstrates how adaptable a smile makeover is – it can use almost any tool of cosmetic and restorative dentistry to give you a smile that will give you confidence and be the envy of your friends and coworkers. The first step to your improved smile is a consultation with your A Supa Smile dentist. In just a few minutes you can learn if a smile makeover is the treatment you need to help perfect your smile. Your A Supa Smile dentist can recommend what treatments will be most effective and economical for your individual case. A stunning smile may be only a few visits away!